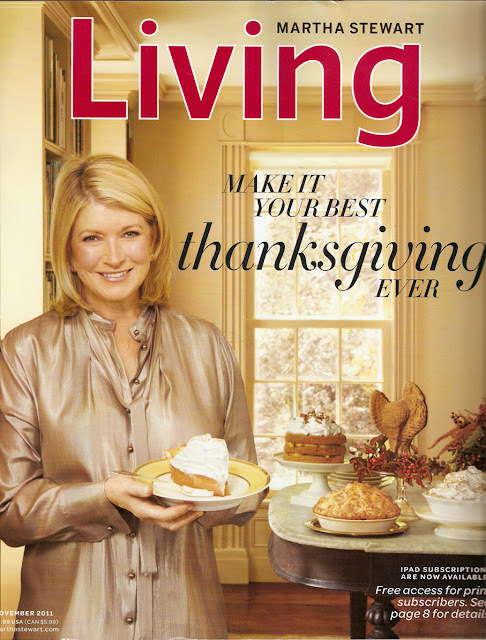 While most of us here in Canada have already enjoyed our Thanksgiving meals, I still look forward to the November issue of Martha Stewart Living with all of its homey comfort and pre-holiday hullabaloo. 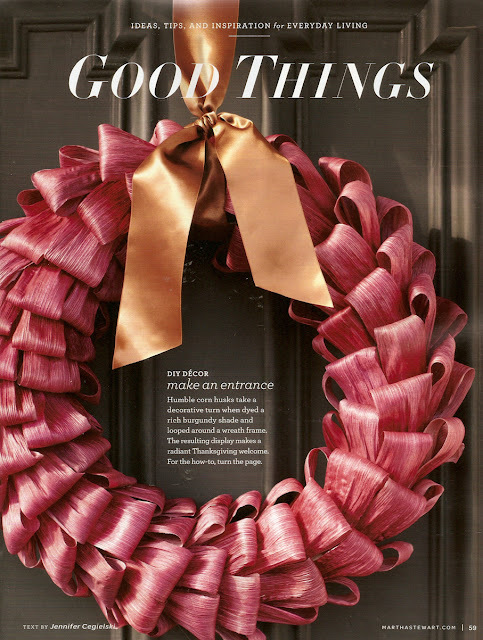 This issue is filled with the sort of warmth and coziness us longtime readers so enjoy! There are table decorating ideas, festive fall crafts, delicious holiday recipes (including mile-high desserts) and plenty of holiday strategy ideas to help streamline and simplify the busiest time of year. There are fresh and new ideas, too, including an entirely vegetarian Thanksgiving spread, a look at a perfectly imperfect home designed for active living and the restoration of a 200 year-old hotel in Pennsylvania. Also included is an excerpt from Martha's Entertaining, which is due out on the 25th of this month: Martha shares some new Thanksgiving recipes from a dinner she hosted at Cantitoe Corners. Get the issue on newsstands now! Martha makes an appearance on the cover of the November issue. There are plenty of Good Things in this issue, including this festive wreath made of corn husks dyed a deep burgundy. 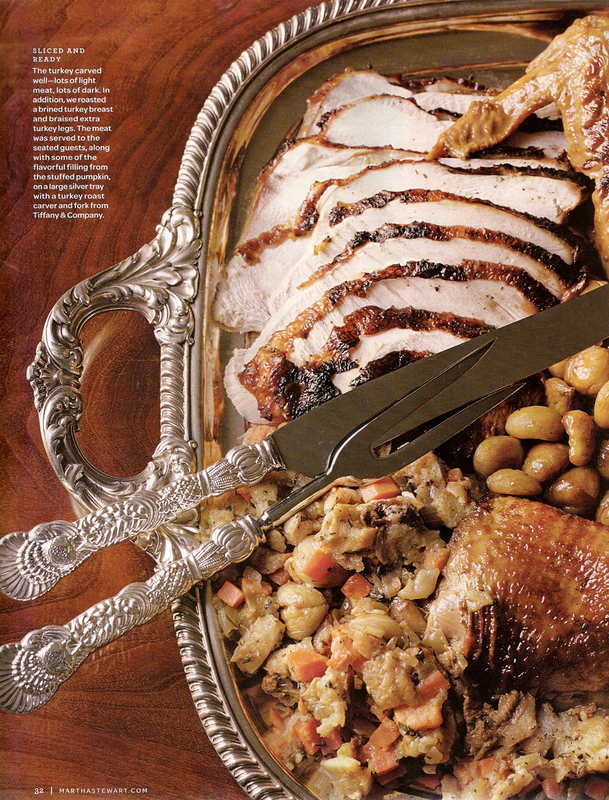 Martha used her silver Tiffany & Co. serving set for this mixture of light and dark turkey meat and pumpkin stuffing. 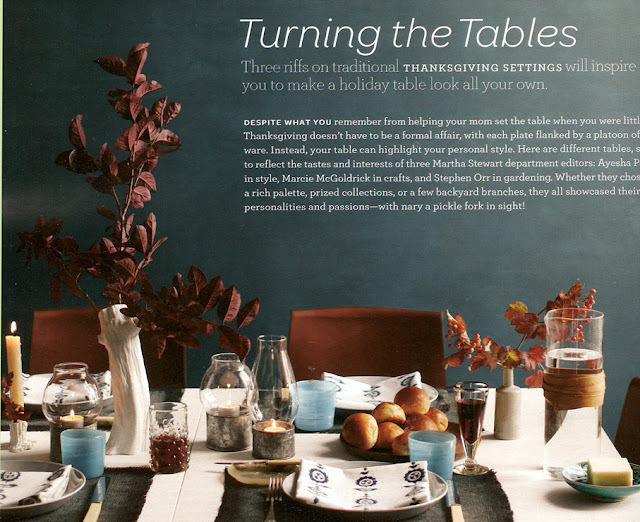 Introducing fresh and modern ways to set the Thanksgiving table. 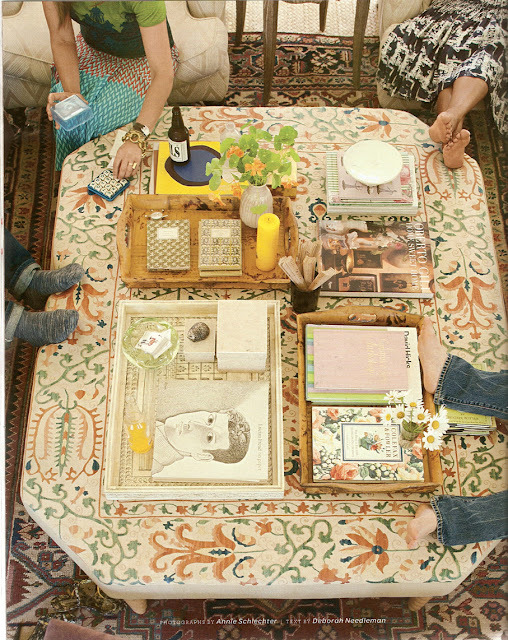 Deborah Needleman's new book "The Perfectly Imperfect Home" looks like it's going to become a classic. With an emphasis on living for real life, she balances style and design with practicality and function. 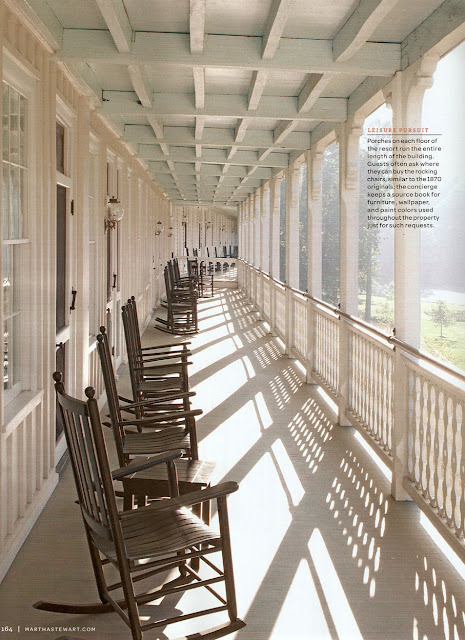 This porch at the Omni Bedford Springs Resort in Pennsylvania invites cool breezes and sunny warmth. It is part of a massive restoration project that rescued this 200 year-old hotel from virtual obscurity. Very nice! I'll have to get one! Thanks for the link. I really like this issue! The ones sold at newsstands have a slightly different cover. Martha is holding a stand mixer bowl next to some of her delectable desserts.